The Eagles’ Harmon Marien fought for the puck along the boards against Antigo Friday night at the Dome. Northland Pines defenseman Tucker Wittkopf and goalie Brett Wilkins tried to keep an Antigo player away from the net in action against the Red Robins Friday. 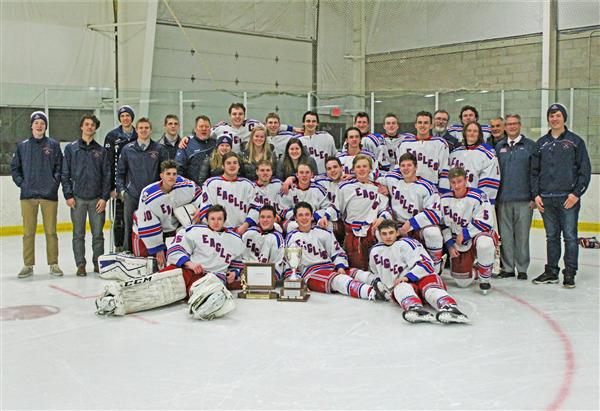 The Northland Pines boys hockey team was crowned the first ever Great Northern Conference (GNC) and tournament champions with a 9-2 victory over Waupaca in Antigo last Saturday. 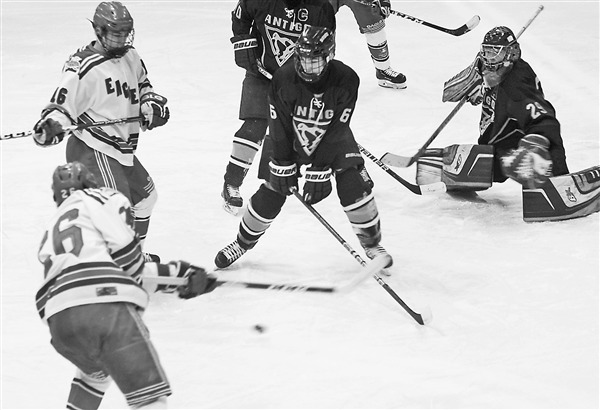 To get to the GNC title game, the Eagles beat Medford 7-0 in the quarterfinal game back on Jan. 24 and then shut out Antigo 6-0 in the semifinal in the Dome on Friday. Cox said he was expecting a tighter game, but the Eagles blew it open once they got their second goal of the game three minutes into the second period when Brady Snedden scored on a shorthanded break-away. Assists were credited to Alex Sternhagen and Harmon Marien. It was David Sauvola, however, who got Pines on the board in the first period off of a screen and tip play, with an assist coming from Kevin John’s blast from the point. Marien made it 3-0 after Snedden’s goal. Then Sauvola poked home a rebound halfway through the second period for his second goal of the night on an assist from Zach Maillette to make it 4-0. Answering the Waupaca goal was Gunnar Schiffmann, who came down on a 2-on-1 with Tyler Hunt and Schiffman blasted one past a startled Waupaca goalie to take the momentum right back. Maillette then scored off a feed from Sternhagen and Sima, followed 30 seconds later by a high-light reel goal by Lochlan Seigmeier. “Lochlan’s sheer speed and stick handling dusted past a Waupaca defender through the feet and picking up the puck up on the other side and then tucked it under the Waupaca goalie Brett Berens to finish the play,” said Cox. Assisting on the play was Cooper Cox, who sent a pin-point pass from the bench to a streaking Seigmeier. Waupaca scored a power-play goal late in the third period. “We got a little undisciplined and Waupaca scratched one across the line against a surprised Brett Wilkins, who deserved a better effort in front of him defensively on the night,” said Cox. Wilkins finished with 11 saves. Waupaca goalie Berens made 43 saves. Snedden scored his second shorthanded goal on the night off an offensive zone faceoff to put the game back into running time. Finishing the offensive barrage was Jacob Wielhouwer, scoring his first high school goal during a skirmish in front of the net, with assists going to Snedden and Marien. “The kids get pretty fired up when we have moments like that where we can all celebrate together a teammate’s first career goal,” said Cox. When the horn sounded, Northland Pines was perfect on the season, going 7-0 during the conference round- robin play and 3-0 the past week to win the first ever Great Northern Conference Tournament. The Eagles topped Antigo 6-0 in the Dome last Friday night to advance to the GNC title game. Pines came out firing in the first period and put 25 shots on Antigo goalie Brody Bunnell. Snedden started the scoring early for Pines after picking up a loose puck in the corner and weaving through traffic to catch a leaning Bunnell with a short-side snipe. “That was a great goal using his stick handling skills, but more importantly moving his feet and cutting the seam between defenders and finishing it off to get us started,” said Cox. Shortly afterwards it was Jack Rhode who scored with assists from Hunt and Schiffmann. Tyler Hunt finished the scoring in the first with an assist from Schiffmann to make it 3-0. 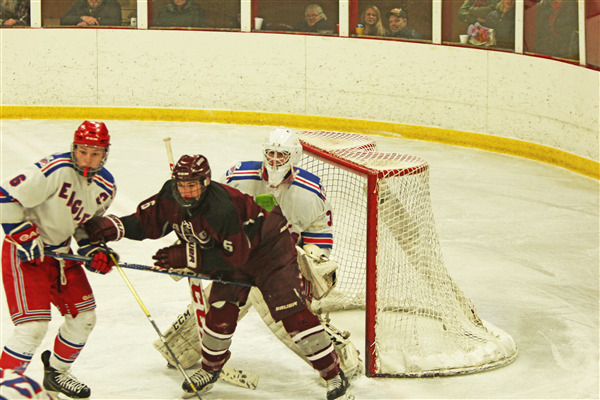 The second period was jump-started by Andrew Rothmeier and his speed beating the Antigo defense to a loose puck off the draw that he poked to a racing Marien, who split the defenders and got the puck past Bunnell just 6 seconds into the second period. Snedden and Rothmeier had assists on the Marien goal. Less than 5 minutes later, it was Maillette scoring on a 2-on-1 that turned into a semi breakaway with Sima, who sent him in all alone for the score. David Sauvola generated the scoring play on a clearing pass that hit a streaking Sima and Maillette to ice the game at 5-0. Not to be outdone on the very next shift, Marien scored his second of the period on an assist by Snedden and Rothmeier to send the game into running time. “We could not ask for anything better than a six-goal, run-time lead with the quick turn-around prior to the championship tournament game Saturday night,” Cox said. Pines goalie Wilkins recorded his fourth straight shutout on 15 saves and holding the opponents to over 251 minutes of scoreless hockey. “We did a nice job of playing pretty simple hockey, moving the puck and making basic speed plays,” said Cox. The WIAA seeding was held Sunday and Pines was seeded No. 2 in Sectional 3. Wausau West, who beat the Eagles 4-3 earlier this season, got the No. 1 seed. Pines got a first round bye and will face the Stevens Point Pacelli/Lakeland winner on Thursday, Feb. 14, at 7 p.m. in the Dome. Pacelli is seeded 10th and Lakeland seventh. This week, the Eagles, the top-ranked team in the state, will battle fourth-ranked Superior in Superior at 7 p.m. this Thursday, Feb. 7. Then on Saturday, Feb. 9, Pines will host Appleton United at 2 p.m. for Seniors Day. The junior varsity will play prior to both games. “We will see how we handle another top-10 team in the state on the road with another opportunity to get better and improve preparing for the playoffs,” said Cox.